A 3D printed can filler. Photo courtesy Concept Laser. Jung & Co is a processor of stainless steel and caters for an array of sectors ranging from the food and beverage industry, pharmaceuticals and chemical engineering, plant engineering, aviation through to the fossil fuels extraction industry. One specialty is the production of spare parts made of stainless steel for beverage filling plants. The company uses a M2 cusing Multilaser machine from Concept Laser to make the parts. The company can also make spare parts on demand using the additive manufacturing (AM) process, reducing downtime in the process. This story is reprinted from material from Concept Laser, with editorial changes made by Materials Today. The views expressed in this article do not necessarily represent those of Elsevier. 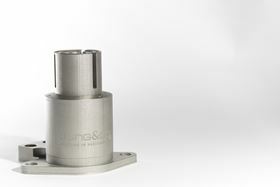 EvoBus GmbH has worked with plastics and metal 3D printing specialist EOS to help streamline spare parts production for its range of omnibuses. Researchers at the University of Pittsburgh have received a US$350,000 grant to develop new, computational methods for AM.